Today I was on the way to deliver a talk to Macclesfield Writers group on historical fiction and self publishing. I had a little time to kill so decided to visit Sandbach. There, in the middle of the cobbled market square of this old market town are two stone crosses of great antiquity. They are at least twelve hundred years old and I wanted to see them as they represent probably the finest as well as some of the earliest Saxon Christian symbols that still survive. Sandbach is actually a pretty little market town and by chance there was a market going on down the high street theu still call the Crosses Market. The town centre is this little square surrounded by pubs and half timbered buildings some of which date back to the 16th century and earlier. However it was the crosses I wanted to see as these predated anything in that square by at least half a millennia. 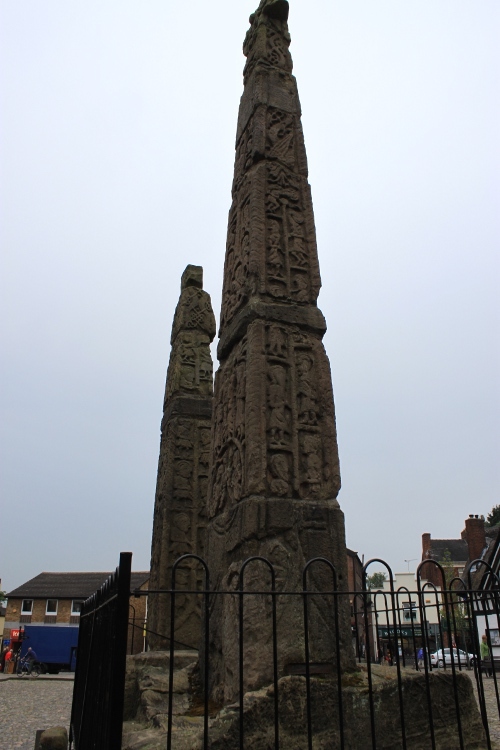 There are two crosses at Sandbach. They are richly engraved with biblical scenes, creatures and vines and must originally been an amazing site. What do we know of their origin and age? The answer is actually very little. The earliest documentary mentions of the crosses is by William Smith who was the Rouge-Dragon Pursuivant at Arms of Elizabeth I, who was originally from nearby Nantwich. In 1585 he wrote about the crosses: ‘two square crosses of stone, on steps, with certain images and writings thereon graven [standing] hard together. So by that year they were already in place. But when were they constructed? 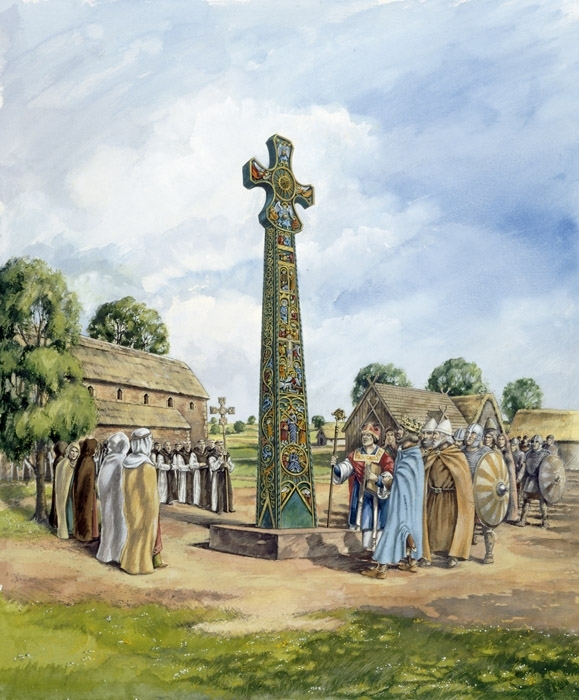 There are legends of the crosses dating back to the 7th century and having been erected to mark the conversion to Christianity of the pagan king Penda of Mercia. However the most accepted view – based upon an analysis of the forms and style of the inscriptions – is that they date from the 9th century. 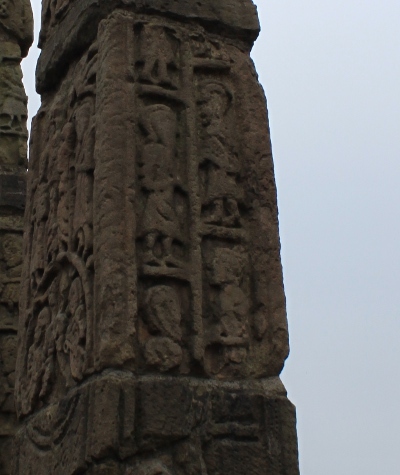 The larger cross was probably carved in the first half of the ninth century and the smaller cross was completed slightly later. It is most likely that the crosses were brightly painted. The current theory is that a religious institution of significance must have existed in the area and that the crosses were a focal point of veneration and worship. However no documentation exists to support this – but then again there is a profound lack of documentation for this entire period. What we do know is that at a later period the crosses attracted the ire of the 17th century puritans and during the Commonwealth were knocked down and the components strewn around the area. One hundred and fifty years later in the early 19th century they were collected together and in 1816 were reassembled at the present site.